The company operates three regional offices and has worked with thousands of customers. Suntrek Industries, Inc., an industry-leading manufacturer of solar pool heating and solar energy equipment, is celebrating its 27th year in business in 2018. Starting from a single location and a patented solar swimming pool heating system, the company has grown exponential over the past three decades. Today, it boasts nearly 30,000 customers across the country who have saved money on heating costs with the company’s energy-efficient solutions. The company continues to introduce innovative solar energy systems, including solar pool heaters, solar energy collection panels, and even solar root heating and nutrient delivery systems for the agricultural industry. “We started with a unique business model and a simple motto: ‘Do what we say we are going to do’,” says Roy Heine, President and founder of the solar energy manufacturing firm. “That commitment to manufacturing and customer service excellence has positioned us well for continued growth in the coming decades.” To learn more about the company’s solar pool heating systems and its expertise in solar energy collection, visit http://www.suntreksolar.com/solar-pool-systems/why-go-solar/ or call the firm at (800) 2 WARM IT. Suntrek Industries, Inc., was established in 1991 in Irvine, California. The first product it developed was a high-performance solar panel system for heating swimming pool water. Innovation continued at the company, which saw the development of a range of energy-efficient solar water heating and solar electricity products in the years since its founding. In 2006, the company diversified its product line extensively, rolling out new technologies and new energy-efficiency with each new product. Suntrek solar power systems can be found in residential, commercial, and government buildings throughout the western states. Today, the company corporate headquarters is still in Irvine and also operates two regional offices, one in Las Vegas, Nevada, and one in Martinez, California. All three corporate offices provide the products and services the company is known for; their “Power of Three” services of solar pool heating, solar power systems, and solar hot water systems are trademarked. The company has worked with thousands of individual and business clients, including large government entities like Yosemite National Park, the San Diego Unified School District, the California Department of Transportation (Caltrans), and the Long Beach Airport. Corporate clients include the McDonalds Corporation, the LDS Church in Salt Lake City, Utah, and the Irvine Company. “Our success over the past three decades is a combination of our hard work and our incredible customer base,” adds a spokesperson for the company. 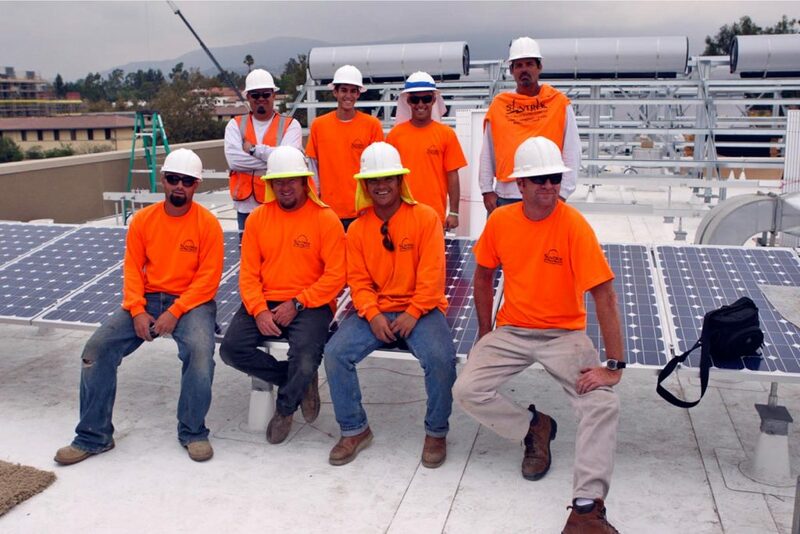 “We look forward to the next 30 years as we provide energy-saving solutions to residential and commercial clients.” For more information on the company and its services, visit http://www.suntreksolar.com/ or call Suntrek at (800) 2 WARM IT. 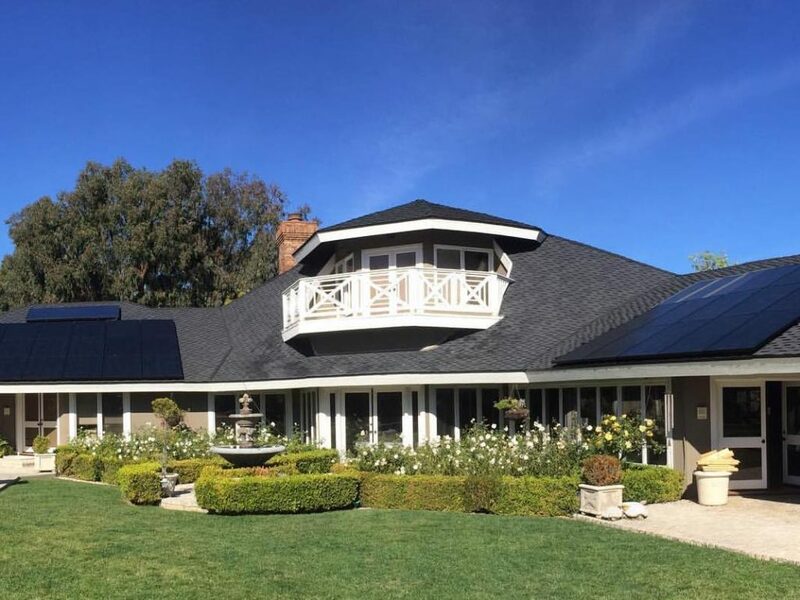 Headquartered in Irvine, California, Suntrek Industries, Inc. has been a leader in solar energy and solar heating systems for residential and commercial customers. The company’s extensive line of hot water and pool heating systems and photovoltaic panel arrays are known for industry-leading efficiency. The company operates three regional offices, and has worked with nearly 30,000 customers across the country. Suntrek has manufactured and installed solar systems since 1991, giving them the experience and the technical know-how to develop energy-saving power and heating systems for any application. Residential Solar Electric System and Solar Water Heating System by Suntrek Industries. When shopping for a new home, always keep in mind one simple question… What will it take to install solar now or in the future? Not every home is feasible for solar. The roof lines might be too cut up with not enough clean space to work with. There could be shading issues or the only good roof may be on the front of your new home and aesthetics can be a serious concern. So, find a home that has great orientation to the sun and enough space to put in a square or rectangular shaped solar system vs one that looks more like a puzzle with panels scattered all over the roof. Consider the age and condition of the roof. If you have to replace the roof in a few years, factor this in before you invest in your solar system of systems. Also keep in mind that if you have a clay tile roof, this can be problematic and will most likely require a new composition roof under the solar system. If your new home comes with a pool, you certainly want to consider heating your pool with solar in addition to powering your home with solar. At the same time, you might as well heat your water in your home with solar instead of using gas. Now you have 3 unique solar systems all designed to power your home, power your pool equipment, heat your pool water, and heat your domestic water. It only takes a few minutes to consult with a solar energy professional to determine how solar can fit your new solar home. Solar Pool Heating System by Suntrek Industries. 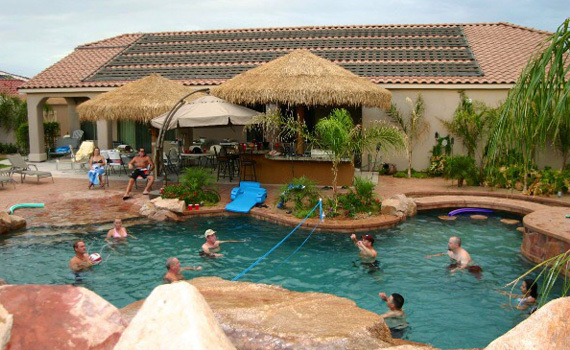 Polymers are the first choice for solar pool heating and have been for decades. These products are comprised of plastics and elastomer compounds. What makes them most appealing is that they have UV inhibitor materials in these compounds to withstand intense solar energy radiation for well over a decade. These materials are also impervious to pool chemicals. So, a long-lasting solar pool collector is ultimately what you will invest in when you select Polymers. Like Evacuated Tube collectors, these are primarily designed for solar water heating, not solar pool heating. Suntrek Industries is one of the leading solar pool manufacturers in the industry. According to the California Solar Initiative (CSI) website, Suntreksolar is currently the Number 1 Solar Energy company for commercial solar pool heating in the State of California. 1. We are both the manufacturer and the licensed contractor on solar energy installations. That means we can handle the complete job from design to any roofing issues we encounter to make sure your system fits and functions perfectly. 2. Suntrek designs and custom builds the solar collectors to fit your roof or structure it is going on. This provides our clients with solar systems that fit best, work best, and perform best. Suntrek is one of the highest rate solar collectors in the world. 3. We are vertically integrated which means no franchises. Our clients work directly with us. Our friendly competitors sell their product through distributors who then sell their products to dealers. 4. All of Suntrek’s customers come by way of referral. Suntrek does not solicit business with direct mail, canvassing, telemarketing, radio or TV advertising. This provides our clients with a lot of confidence and comfort.